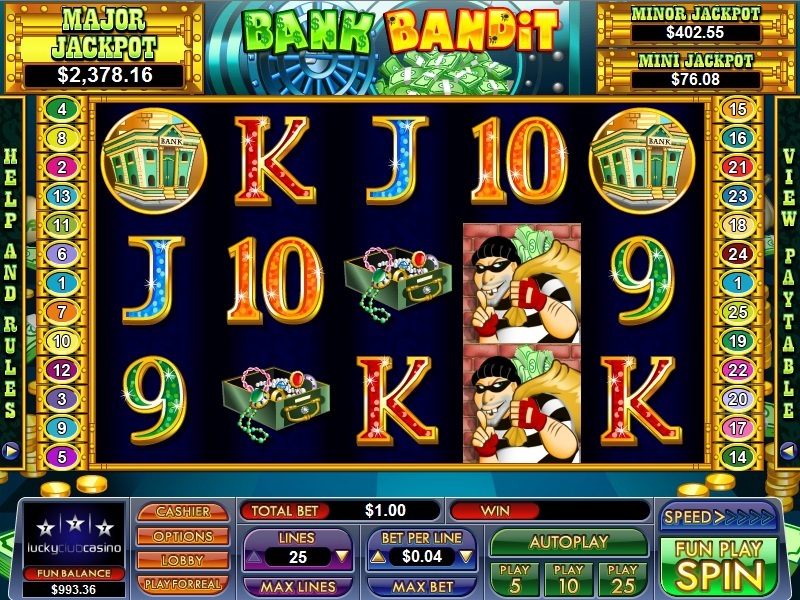 Bank Bandit is the 5 reel, 25 pay-line slot game that has been developed by NuWorks and is one of the developer’s most recent slot releases having been launched at the end of 2012. The game possesses graphics that players of other NuWorks slot titles such as the mystic themed Crystal Ball and the outdoors adventure camping themed Camper’s Cash will be familiar with. Symbols in this game include a Robber, Vault, Policeman, Bank, Bag of Cash, Female Bank Clerk and many more. 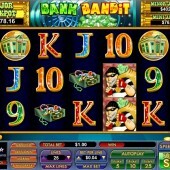 Bank Bandit does not really go above and beyond when it comes to innovative features compared to its predecessors but it does give you what you essentially want from a slot game. The game comes with two main bonus features in the form of the Vault feature and the Robber feature. Both of these features give you the opportunity to win big and they are the central focus of the entire slot. The Vault feature is triggered when you hit three or more Vault scatter symbols across the reels. You will be awarded with between 5 and 15 free spins depending on how many Vault scatter symbols you hit to trigger the feature. The more scatter symbols you hit, the more free spins you will receive. As you play each free spin, the multiplier of the Wild symbol, represented by a Robber symbol, increases meaning that the further into the free spins you go, the larger the potential prize. The Robber feature is arguably the most lucrative part of the game. It is triggered when you hit a Robber Wild symbol on reels 2 and 4 simultaneously along with a Vault scatter symbol on the middle reel. During the Robber feature, each Wild symbol multiplies the prize by 2x, 3x or 4x when it substitutes for another symbol to complete a winning combination. You will be awarded 20 free spins initially when you trigger this feature so you could win a really big prize if you hit the right symbols. There is also the chance to win one of the three random progressive jackpots on offer in this game outside of the bonus features with Bank Bandit giving you the chance to win either the mini, minor or major random progressive jackpots which adds another element to the game. Bank Bandit will thrill you with its two great bonus features but the Robber feature is especially difficult to trigger with you needing to hit the Wild symbols and the scatter symbol simultaneously. You can still win big through the Vault feature but the chase of the Robber feature will have you coming back for more because that is where the real money is won.